It goes without saying that eyelids and eyelashes highlight and bring your eyes out. The procedure will make your eyes to stand out more, it will create a 3D effect, they will look deeper and it will correct your eye shape. When drawing an eye line, pigmentation is done between eyelashes. Contour can be drawn in many shapes but the most popular shape is an arrow. Although your face features will stand out more after the procedure, your eyes will look natural. Micropigmentation is also a great way to enlarge or to make your eyes look smaller. · Upper eyelid contour imitation. Supremely accurate movement of modern needle machine allows to do makeup precisely. · It fills in gaps between upper eyelid eye lashes. It makes your eyelashes look thicker and longer. · A tiny arrow is drawn. It is not recommended to do really big arrows and connect upper and lower contours. · Dots or short lines fill in gaps between lower eyelid eyelashes. Although lower eyelashes are usually light and thin, this technique makes them look thick and dark. · As we get older, eyes corners’ skin starts puckering and this procedure hides it and makes eyes look better. You should not get supremely high pigmented permanent makeup because it might not match you in daily life situations. 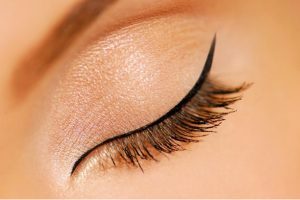 Either you choose a technique between eyelashes or an arrow, the most significant part is to get a beautiful natural looking makeup which enhances your beauty and hides unfavorable things.